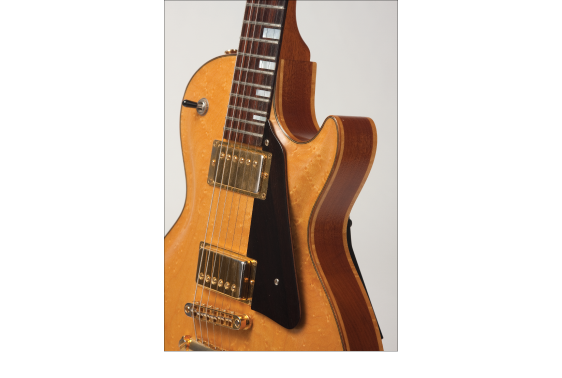 This Les Paul Style electric guitar body is made with Birds Eye Maple and Honduras Mahogany. The body is chambered out giving this electric guitar a special tone. The neck is Mahogany with a Rosewood fingerboard, jumbo fret wire and the headstock veneer is Birds Eye Maple. The pick guard is a thin sandwich of Ebony, Walnut and Ebony. 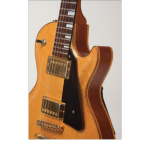 The gold hardware consists of, Humbuckers that are Gibson 57 Classics and the tuners are Gotoh.